The Batik Cascade Quilt Fabric line from Avlyn Fabrics are available in several colors. Each one cascades from light to dark across the width of fabric giving you several fabrics in one. These are just perfect for use in Landscape Quilt Patterns. Coastlines is number 6 in the Accidental Landscapes series from the Quilted Lizard. Easy construction (no templates needed!) yields a one of a kind landscape quilt. Using Batik Cascade Baby Blue will give you a full range of blue for the ocean. Save the leftover blue for the sky in Golf Courses. You can make good use of Batik Cascade Grass in this quilt. Use it for the trees, the green, the fairway and the rough. Wow… all from one piece of fabric! West Coast & Lagoon quilt landscape scenes have colorful skies and one features a sandy beach. Batik Cascade Cerise will give you many different shades for the beautiful sunsets. And Batik Cascade Khaki will work great for the beach areas. The change in shade in all of the Batik Cascade colors moves from the most pale shade to a very deep dark shade. These fabrics will be useful in so many quilt projects. 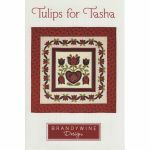 They are great for applique, giving your flowers from flat to full of interest and depth. Even simple log cabin blocks will take on a certain pizzazz. Try a few and have fun experimenting. Cute, colorful, adorable, playful . . . just a few words to describe the new Birdie fabric from Moda. It’s one of those fabrics that you just have to play with. The colors are so bright and cheerful. The Birdie Charm Pack (5″ squares) has 42 pieces. The predominant color is blue but there are also pinks, browns, yellows and greens. Plus several with white background. There are wiggly stripes of brown and blue. Small print daisy-like flowers are found in the blues, greens and pinks. Larger white daisy-like flowers are on tone-on-tone checkered backgrounds. Even larger pink feathery flowers have birds nearby and are found on dotty backgrounds. Simple, cute birdies are on dotty backgrounds and fancier birdies with scalloped wings are perched on curly cues. Finally, there are “yolka-dots”! Multi-colored dots that seem to use every color found in the collection. Charm packs make quick half square triangles and four square blocks, so you can finish a quilt right quick! Just add some white background and this fabric is just right for a new baby blanket. Use more than one charm pack and make a quilt a little girl would love to have on her bed. So, grab a charm pack (or more) and have some cheery fun. If you need help getting started there are plenty of charm pack patterns. Project Linus and Avlyn Fabrics has teamed up and created a fabric collection called Komfort Kids by designer Patrick Lose. This one is Sweet Dreams, the feature design. You could make a fast quilt with a large piece of this fabric bordered by one of the tone on tone fabrics. The tone on tone fabrics are covered in Project Linus style hearts. Aside from the Magenta shown here, there is Tangerine, Yellow, and Lime. The Twinkle Stars also comes in four colors: Periwinkle (shown here), Tangerine, Teal and Magenta all with yellow stars. The Bubbles are lots of different colors with backgrounds in Teal, Periwinkle and Magenta. The last fabric in the collection is Sweethearts. A checkerboard of Project Linus style hearts going in every direction, in lots of colors, with lots of different backgrounds. So many fun fabrics it’ll be hard to choose which ones to use to make your next Project Linus quilt. That just means you’ll have to make more than one! And the bonus is that Avlyn will donate 8% of the sales of this collection to Project Linus. This is on my “GOTTA HAVE” list. I saw this quilt on-line and loved it. Then I saw it in person – LOVED it. The Love is in the Air fabrics were designed by Deb Strain for Moda and she has created another fabulous line. The colors look so good together. And the solid portions have a look almost like they were colored with chalk… very subtle color variations. It adds another pretty element to an already gorgeous fabric. 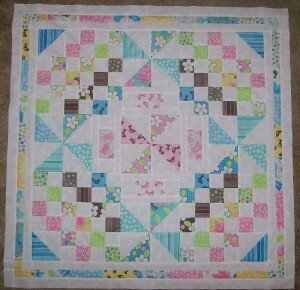 This quilt is featured in Quiltmaker Jan/Feb 2009 issue. There you will find directions for making the heart blocks to add to the panel. 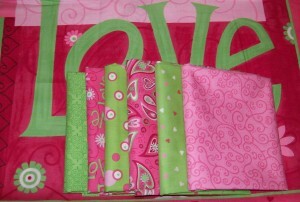 The Love is in the Air quilt kit includes the panel and six fat quarters. There will be enough left over from the fat quarters to make the binding. And the part of the panel that you cut off will make great labels for future quilts. You’ll only need to provide the batting and the backing. Since I started this post, the status of this quilt kit has gone from “I gotta have it!” to “I have it!” – I just couldn’t resist. I may wait until after the holidays to put this quilt together but in the meantime I can’t help but drool over the fabric. It’s just so Yummy! Or, I may get started on it right away and give it as a Chrismas present. Ohhh, it’ll be hard to give up this beauty. I may have to buy another kit for myself. There’s a georgeous new fabric line available. Suzanne spotted it, touched it, at Quilt Market and just had to stock it. She told me, “It looks like linen; it feels like linen. I just love it.” She’s right. It does look and feel like linen… so soft and ‘rich’ looking, but it’s 100% cotton. And the Laurel Cottage designs are beautiful too . 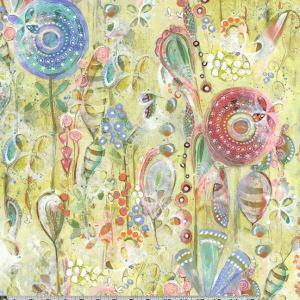 This floral on creme background would work as a main focus fabric or would be great for fussy cutting. Black Cat Creations has a pattern called Charmed that would work great. Use this floral for the center of the stars and alternate the points of the stars with the blue and cream fern patterned fabrics. 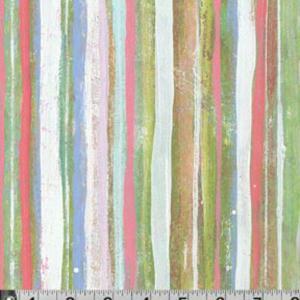 Another pattern that would work well is Floral Impressions by Canyon Creek Fabrics. Another is My Sister’s Trellis by Pams Piece by Piece. And Picture Perfect by Diane Weber Sew Biz. And Prairie Window by Quilt Woman. So many possibilities! Or why not try your hand at designing your own quilt. 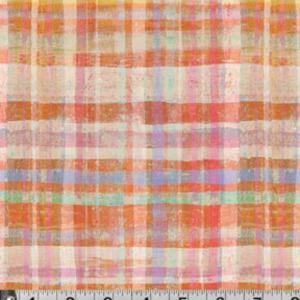 This “plaid” would make a nice inner border. The fabric below could be fussy cut for a border also. 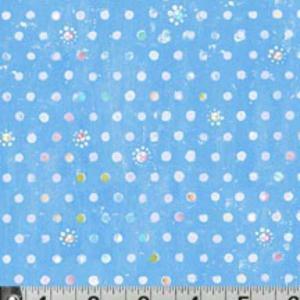 The fabric line includes a smokey light blue with flowers all over, a green on green, and a darker blue on blue. All so pretty and so soft . . . wish we could give you a chance to touch it! Check out the entire fabric line and browse the quilt patterns – see which pattern you think would really showcase this fabric. Quilting is always enjoyable but you’ll add an extra dimension to your enjoyment when you get to feel this fabric while you are creating with it!